Any business that doesn’t make a profit could have to close its doors. That harsh truth causes some businesses to put money before the well-being of others. Those businesses would be better off if they educated and empowered their customers. Being an educated consumer prepares you to make smart choices. And before you ask, yes – education can benefit the bottom-line. Here’s how. 1. Educating women will make them less resistant to necessary repairs. Auto repair shouldn’t be viewed any differently than rent or groceries. It is a basic life necessity that every responsible adult should be prepared to afford. The problem? The auto industry is losing credibility. Most people have heard a story or been ripped off by mechanics in the past. They can’t tell the difference between a con and a necessary repair. The solution? Educate your customers. Smart drivers are willing to pay for services that keep them safe. Take her outside and show her the car part that needs to be replaced or repaired. Describe how this service will benefit the customer in her own language. 2. You can make the sale without seeming pushy or annoying. People do not like to be sold. It’s not fun to try to convince people they need something they don’t want. Desperation is not an attractive quality. If you’re too pushy, customers will get annoyed and take their business elsewhere. If you educate your customers, they will become empowered. They don’t need to be talked into a purchase. It’s a foregone conclusion. The professional who did that educating is now empowered too. And you earned yourself a customer. 3. Earn loyal customers. Educating women is empowering. You’re not selling anymore. You’re building relationships. Do you think it would be easier to earn one customer who buys ten different services, or earn ten different customers who buy one service each? The first choice sounds a lot better to me! Aggressive techniques might get a single sale, but they probably won’t result in repeat business or referral. It’s best to educate and empower customers so you can earn their trust. If you do that, they will come back over and over again. If you don’t believe me, ask Sid Syms. 4. Customers will tell their friends about you (hint: women talk!). Word of mouth is the best friend of any business. If you keep your female customers happy, they will send you referrals. If you take advantage of women, they will warn people to stay away. Encourage your customers to leave a review at www.WomenAutoKnow.com. We’re all about women empowering other women to have a choice by sharing their auto shop experience. There is a growing disconnect between drivers and the shops that serve them. If the auto industry has any hope of surviving, we need to improve its perception. Join us today. Please share this post with the folks in your auto shop so they can join Women Auto Know and be a part of the solution. Why don’t more women pursue a career in auto repair!? If I had a dollar for every time someone asked that question, I would be filthy rich. Female mechanics are very rare. In 2013, over 98% of mechanics were men. There are a lot of reasons for that, but first you should know the auto industry is woman friendly. Indeed, women held 25.4% of auto industry jobs in 2013. They just aren’t fixing engines. Where are they? Check out the chart below (source). See that big green line next to “Office and Clerical Workers?” There’s your sign. Most women in the auto industry are filing documents, answering phones, preparing reports, and other back office stuff. That makes sense. According to socially accepted gender roles, it is “masculine” to be a mechanic and “feminine” to be a secretary. Gender roles are just social constructs. Like the Sasquatch, people made them up. They are as fictional as a fairy tale. Individuals are too complex to stereotype. Not all men like to get their hands dirty and I know women who get a rush out of it. Guess what? I’m one of them! It’s hard to work on cars, but women and men are equally capable to build strength and skill. The real question is this: “Will more women take an interest in auto repair?” I hope so. More and more females are getting stuck with college degrees they can’t even put to use. It’s sad to see talented women struggle looking for careers and overlook an entire industry. A career is supposed to be empowering and rewarding for your life. If you know a woman who’s interested in this field, please send her my way. And thank you to Charles for asking for my input (this is probably more than he bargained for!). Dig this post? If so, please share it with your friends on Facebook and Twitter. Click here to check out the new Women Auto Know (more updates coming soon!). It’s tempting to put off a trip to the auto shop, but that could result in a more expensive repair. You don’t have to be a victim of auto anxiety. If you’re curious about the most common causes of the check engine light, this blog is for you. 1. Your oxygen sensor needs to be replaced. Oxygen sensors analyze the air and fuel in your engine. It passes information along to the catalytic converter, which turns dangerous emissions into less harmful substances. In other words, they work together to prevent air pollution. If your oxygen sensor function malfunctions, your gas mileage could decrease by up to 40%. It gets worse. Neglecting to replace your oxygen sensor could lead to the death of your catalytic converter. That would turn a $200 repair into a $2,000 repair. Don’t risk it. 2. Your fuel cap is loose. It only costs a few bucks to replace your fuel cap… and the one you have might just need to be tightened! This is why you shouldn’t assume the worst when your check engine light comes on. Leaks, odors, fumes, noises, or jerky motions tend to accompany serious car problems. Nothing like that? It might just be your fuel cap. Pull over, unscrew your cap, and put it back on as tightly as you can. Go to the shop if the “check engine” light stays on. Consider yourself lucky if it turns off. 3. Your catalytic converter crapped out. You had to know this was coming, right (see point #1)? This is the most expensive repair on this list… and it’s completely preventable! Don’t procrastinate when it comes to auto repair. Trust me. 4. Your spark plugs are failing. You might never have to replace your spark plugs. They could last 100,000 miles in vehicles that were made after 1996. If you’re striving for the 200,000 mile club, you’ll definitely need to change your spark plugs at some point. Delaying this repair could cost you thousands, since bad spark plugs can cause permanent damage to your catalytic converter. Are you a DIY sort? Replacing spark plugs isn’t very difficult (once you take everything apart to get to the plugs). Watch this video for a demonstration. 5. Your mass airflow sensor is having some issues. Your mass airflow sensor (MAF) measures how the mass of air is flowing through your engine. It uses that info to determine how much fuel your engine needs to perform efficiently. If your vehicle is stalling at the time of your “check engine” light, your MAF might be malfunctioning. This can lead to an increase in emissions and 25% decrease in fuel economy. No matter what is causing your check engine light, get your car to a mechanic as soon as you can. Did you find this blog helpful? If so, please share it with your friends on Facebook and Twitter. Potholes can cause significant damage to your vehicle. Don’t take potholes lightly. They can flatten tires, knock out hubcaps, and mess up your wheel alignment. According to AAA, potholes caused $6.4 billion in damage last year. On average, potholes cause roughly $5.4 billion in damage every year. Hitting one pothole probably won’t hurt your vehicle. If you drive over potholes on a regular basis, the damage could add up. Why are potholes so much worse during spring? Rain and snow sneak into roadway cracks during winter. If it gets cold enough, water freezes overnight. There isn’t enough space to contain a block of ice, so dirt and gravel get shoved out of the asphalt. When that water melts, a hole is left in its place. The hole grows in size as people drive over it. Potholes can’t be eliminated due to limitations with the material used to make our roads. Some experts suggest following a strict road maintenance schedule can decrease the severity of potholes. Cautious drivers can prevent expensive repairs. There are a few ways to protect yourself. First, heighten your awareness. If you’re not paying attention, you might not see a pothole until it’s too late. Keep an eye on the car in front of you. If it makes a sudden movement, the driver could be steering to avoid a pothole. Don’t follow them too closely or you won’t have enough time to get out of the way. Slow down in areas where you know there are potholes. If you roll over a pothole, don’t slam your brakes. It’s better to gently roll over it. Finally, make sure your tires are properly inflated to make a flat less likely. Share this blog on Facebook and Twitter so your friends can save money and be a safe driver like you. 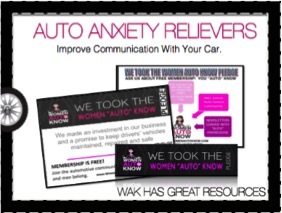 Click here to join Women Auto Know (it only takes a second!). If you follow the news, you probably know air pollution is a big problem. Some scientists believe air pollution could lead to global warming. Thus, the government mandates clean-air laws that limit the amount of pollution cars can produce. This is how the catalytic converter was born. Some of the scrap metals used to make this car part are worth more money than gold. Its theft is becoming a common problem in New York. Continue reading to discover how catalytic converters work. I’ll also share our ways to protect yourself (and your bank account) from thieves. Auto manufacturers adopted the catalytic converter to comply with regulation introduced by the U.S. Environmental Protection Agency in 1975. The function of the catalytic converter is contained within its name. It converts harmful pollutants into less harmful emissions before they exit your car engine. The nuts and bolts of this process are a bit more complicated, but you get the idea. The catalytic converter consists of scrap metals like platinum, palladium, and rhodium. Platinum is more valuable than gold, so thieves have taken note. 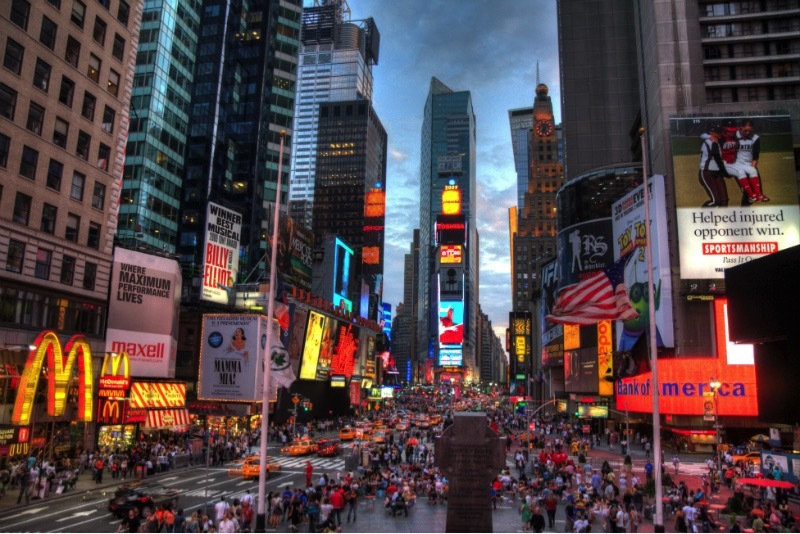 According to the New York Times, stolen converters could be sold for $200 at a scrap yard. It is easy to steal a catalytic converter for three key reasons. First, thieves don’t have to break into the vehicle to access the converter (that means your alarm system won’t make any noise). Second, thieves don’t have to jack up large vehicles like trucks or SUV’s to access the converter (that makes it easy to crawl underneath and saw it off). Third, the theft can be finished in less than a minute. I don’t mean to scare you, but it is important to be aware. The NYPD offers several safety tips. I will summarize the best ones here. Park in busy, well-lit areas to discourage thieves. Find a parking spot as close to building entrances as you can. If you work in the city, secure a parking spot in a fenced in area (bonus points if there are security guards). You could also find a trusted auto shop on Mechanic Advisor to discuss additional options such as theft deterrent systems and securing that converter to your vehicle with steel. Please share this article with the women in your life so they can be protected and informed like you. Most people procrastinate when it comes to taking care of their car. This is not okay. You need to know procrastination is the first sign of auto anxiety. 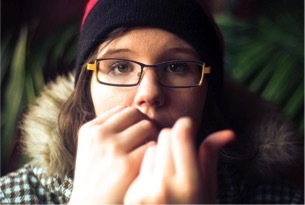 If it goes unchecked, it can quickly transform into a full-blown case of auto anxiety. If you want to be a safe driver, look out for these six signs that you suffer from auto anxiety. You assume all mechanics are out to get you. It is completely illogical to believe all mechanics are bad people. Yes, some mechanics might take advantage of uneducated consumers, but this isn’t a problem specific to the auto industry. It’s just simple human nature. Some people are willing to rip you off and no industry is exempt from this fact. There are dishonest doctors, bankers, and lawyers, too. Have high expectations of the mechanics you choose to hire, but don’t automatically assume they are out to get you. You get oil changes much later than suggested. Getting an oil change and necessary maintenance at the recommended time is one of the cheapest ways to protect your vehicle. Complaining about that small cost is a symptom of short-term thinking. Would you rather pay a few dollars for a cheap service now or risk paying a much higher amount for an expensive repair later? You aren’t prepared to deal with auto-related expenses. Auto anxiety is often a direct consequence of a failure to prepare. I hate to break it to you, but your car will definitely need to be repaired sometimes. You might as well brace yourself for this reality. If you have more than ten pairs of shoes in your closet, then I am confident in your ability to save enough money for this purpose. Simply save 5-10% of your paycheck every month and put it in a separate account that is difficult to access (hint: this will make it less likely you will be tempted to spend it). You don’t investigate strange noises and dashboard lights. If you only heard a strange noise one time, then it might not be worth worrying about. If you hear that same noise several times, then you definitely need to get it checked out. Your safety is more important than the amount of money in your bank account. Go see a mechanic as soon as a problem presents itself. You think a problem will go away if you ignore it long enough. There is nothing to be gained from ignoring auto issues. I know you might be anxious due to a lack of funds, but procrastinating will only make your problem worse. Neglecting a damaged car part will only result in a more expensive repair. Look at it this way. Is saving $100 today worth doubling your risk of having to pay $1,000 tomorrow? You haven’t even read one page of your vehicle’s instruction manual. Cars aren’t as complicated as you think. You don’t need to be a car expert. You just need to be mindful and considerate of your vehicle’s needs. Reading your the owner’s manual that came with your vehicle (OMV) will arm you with knowledge. You’ll discover a suggested maintenance schedule, the meaning of dashboard lights, and more. For more general information, browse through this blog to your heart’s content (don’t forget to subscribe for email updates and I’ll make sure you never miss a post!). It takes time to get over auto anxiety, but any woman can become car smart as long as she is open minded and patient with the learning process. Please click the share button if you’d like to help another woman be safe on the road. I’m amazed at some of the things people do in my auto shop. Sometimes, a customer will march inside and announce, “I don’t know anything about cars!” Seriously. I use this opportunity to educate them, but less honest mechanics might capitalize on the situation. Don’t do these five things just to be safe. Stay calm, no matter how afraid you might be. Getting upset will just make a bad situation worse. Never tell a mechanic you’re “clueless.” Stick with the facts. Describe what happened and let the professional do their job. 2. Try to diagnose your car problem. The Internet is a great place to research, but it’s hard to make sense of it all. You won’t figure out what caused your car problem in a single web search. 3. Make yourself look small. Body language is a big deal. Fidgeting, crossing your arms, and avoiding eye contact will make your insecurity loud and clear. Listen to a song that makes you feel positive and upbeat before you go inside. Put on some confidence! Telling a mechanic to do “whatever” is the verbal equivalent of a blank check. There are tons of services that could be performed on your vehicle. You don’t need most of them. Be as specific as possible. Otherwise, you might get stuck with a bill for unnecessary repairs. 5. Pay for repairs you didn’t request. Would you pay for a steak dinner that you didn’t order? I didn’t think so. If a mechanic does a repair without your permission, ask for a manager and refuse to pay for it. Don’t do these things in auto shops. If you do, you’ll look like an easy target. That’s no good for your pocketbook! Click here to share this post with your friends so they can save money too. What’s that Big “W” on Motor Oil? On the go? No problem! Listen to our blog here! important. So let me enlighten you fine ladies and gentlemen. The “W” on motor oil labels stands for…. drum roll please…. Winter. Whaaaaat? I know, not that exciting, is it? But it is important. And here’s why. Oil weight, or the oil viscosity, refers to how thick or thin the oil is. Temperature affects the flow of oil in the same way it affects the flow of other liquids. Think about it. If you took cooking oil and stuck it in your freezer, it would begin to thicken and solidify. The same thing happens with motor oil. The thinner the oil is, the easier it will flow through the engine. When it’s cold, the oil naturally becomes thicker. In order to maintain a healthy engine, the oil needs to flow through it with ease. This means engines need oil that is thin enough for cold starts and thick enough when the engine is hot. An oil is rated by the SAE* for viscosity by heating it to a specified temperature and then allowing it to flow out of a specifically sized hole. Its viscosity rating is determined by the length of time it takes to flow out of the hole. If it flows quickly, it gets a low rating. If it flows slowly, it gets a high rating. Oils meeting the SAE’s low temperature requirements have a “W” after the viscosity rating (example: 10W), and oils that meet the high ratings have no letter (example SAE 30). Before you select a motor oil for your vehicle, check your owner’s manual and see which one is recommended. Then look to see which motor oil will maintain fluidity in your particular climate and season.